Twitter can only tell you so much. 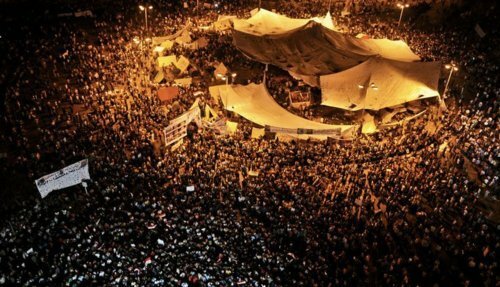 I did what I could to keep track of the massive protests that began at Tahrir Square on Friday (and continue), but our friend Susannah Vila, in Cairo on assignment for Movements.org, was able to report from the scene. Besides the diversity of interests, this weekend also witnessed extreme diversity in demographics—at times it’s hard to tell if you’re standing in the middle of a festival or a political protest. Small families walk around taking in the sights. Children hold posters and chant political slogans. You’re nearly as likely to see a woman demonstrating as you are a man. The more diverse the crowd, the more powerful—because it appears to be more representative of the population, and thus more of a threat, and also because the more women and children the more complicated the calculus for a military wondering whether or not to send in the tear gas as they did a week ago. The square is once again guarded by volunteer security checkpoints and kept clean by volunteer trash collectors. Occasionally a call for more checkpoint staffers goes out on the loudspeaker, and more volunteers head to a meeting point near the Egyptian Museum on one side of the square to sign up. 1) The immediate release of all civilians who have been sentenced by military courts and their retrial before civilian courts. Military trials for civilians are to be totally banned. 2) A special court should be established to try those implicated in the killing of protesters during the January 25 Revolution, and all implicated police officers are to be suspended immediately. 3) The sacking of the current minister of the interior and his replacement by a civilian appointee, to be followed by the declaration of a plan and timetable for the full restructuring of the Ministry of Interior, placing it under judicial oversight. 4) The sacking of the current prosecutor general and the appointment of a well-respected figure in his place. 5) Putting Hosni Mubarak and members of his clique on trial for the political crimes committed against Egypt and its people. 6) Revoking the current budget and the drawing up of a new draft budget that courageously acts to respond to the basic demands of the nation’s poor, and putting that draft budget to public debate before its adoption. 7) Clear and open delineation of the prerogatives of the Supreme Council of the Armed Forces, ensuring its powers do not infringe on the powers and prerogatives of the cabinet. The prime minister should have full powers to appoint aides and members of his cabinet, once that cabinet is purged of the remnants of the old regime. Noticeably absent is any demand for delaying elections, which would benefit nascent political organizations that have been emerging since the fall of Mubarak, but which the more-established Muslim Brotherhood has opposed. Also significant is the call for economic policies fairer to the poor. The message from the street, anyway, is clear: The people are watching, and they’re not going to let their revolution be betrayed.